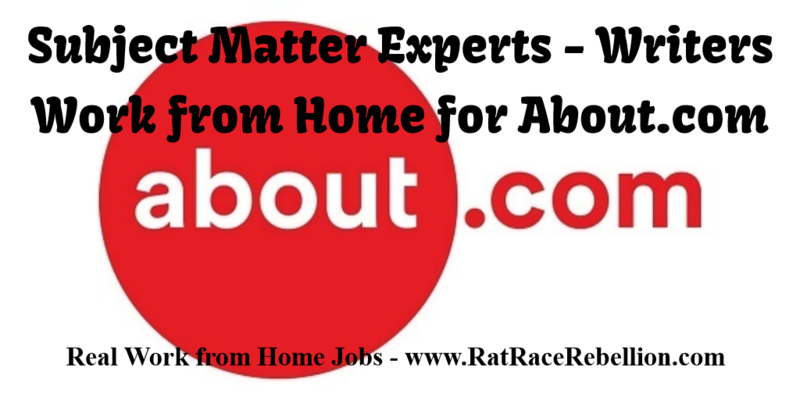 About.com is one of the most visited websites in the US and they are always looking for subject matter experts to write on a wide variety of topics. These are freelance roles that require an existing expertise in your subject area and great research skills so you can dig in deep as you produce content on your topic. They are always posting new topics in the areas of Travel, Tech, Style, Money, Industry, Home, Health, Food, and Education and include topics like Tattoos & Body Piercings, Shoes, Logging, Work-Life Balance, Insurance, Boston, Plumbing, Type 1 Diabetes, Down Syndrome, Mathematics, College Life, Expert Recipe Creator and SO MANY OTHERS (seriously, SO MANY… you really need to check it out as it’s extremely diverse). They’re very thorough in their application process, so make sure you really are a subject matter expert and that your writing skills are fabulous before you apply! Click here to learn more about Writing for About.com! This entry was posted in Hiring Companies, Work at Home Jobs, Writing & Blogging and tagged About.com. Bookmark the permalink.